With this theme of recognition, that the care for the environment – as epitomized by New Brunswick’s famed Miramichi River and its treasured Atlantic salmon – is work that is never done, the Miramichi Salmon Association initiated a major 6oth Anniversary fund-raising campaign in early 2013 to help perpetuate for generations to come, the conservation of these wondrous, but seriously threatened resources. In doing so, the MSA asked all those who cherished the Miramichi salmon to consider new and higher levels of lifetime support and commitment for salmon conservation, thus ensuring the financial base with which current conservation programs could be expended and sustained, and upon which the financial support of future generations would be inspired. After eighteen plus months, the public phase of Campaign 60 concluded on April 26th, 2014. A total of 461 separate campaign gifts and multi-year pledges amounting to $2,678,410 were received, an amount one-third greater than the original campaign goal of $2,000,000. 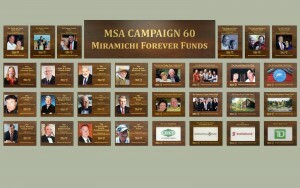 The MSA sincerely wishes to thanks all those who found it possible to support Campaign 60 and the Miramichi Forever Funds it has initiated. Additional thanks to the 100 plus volunteers who canvassed on behalf of Campaign 60.
currently on display at our office in South Esk, NB.